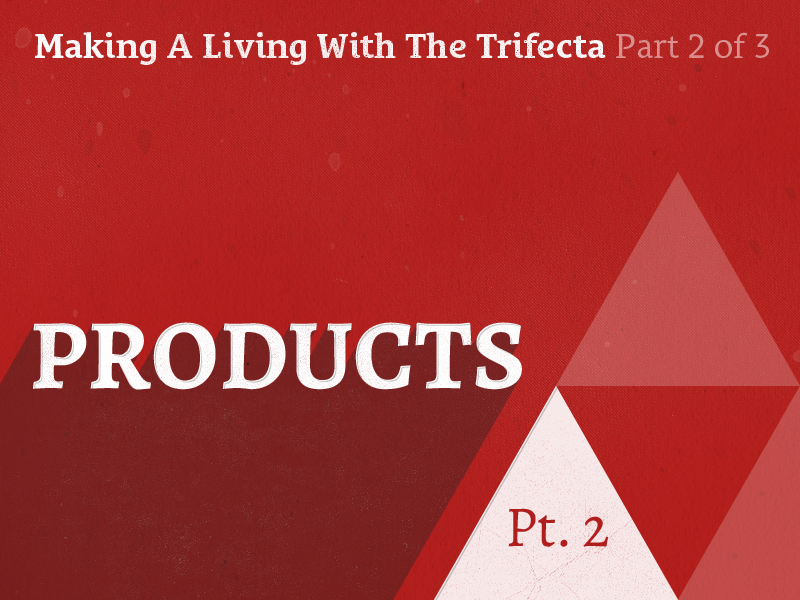 The 2nd step in overlapping with The Trifecta is Products. Using money saved from client work, we talk about treating products as a long term investment and not expecting to see quick returns. We hit on a plethora of product-related topics including creating demand, ecommerce platforms, shipping, systems, when to restock, how much inventory to purchase, crafting the customer experience, how many products to launch with, what kind of conversion rates to expect, and insight into the right kind of emails you should send leading up to a launch. Learn about launches, marketing, and why it doesn’t matter if you lose money on your first product. That first experience someone has with your brand is critical. Don’t focus on making money—focus on creating loyalty and lifelong customers. The whole experience IS the product. 03:05 Client work supports the products. Products are an investment. You have to think of products as a long term investment. 03:42 The Trifecta is integral to The Overlap Technique. 04:04 Avoid being in a scarcity mindset when you make products. You can’t think in terms of “I need to sell 100 of these new items this month to make enough so that the profit after expenses pays my bills.” Treat the money you’re putting into it as a 1-year investment. Don’t try to squeeze out the profits every month to pay bills—reinvest those profits. 06:48 Start with either 1 or something like 4 (or more). The biggest hurdle is just getting a product out there. 07:06 Whichever one you feel like is easier to start doing. Once you get accustomed to the process, you’ll more easily be able to to continue putting out products. The hardest part is getting started: Put out your first product and ship it. 07:27 If you have the capacity or means to be able to launch with more than 1 product, then have at least several. 2 or 3 feels somewhat limited, whereas 4 makes someone feel like they have some options. 08:50 Yes, first focus on growing your audience and generating some demand for the products you’re about to make (Related: e066 Growing Your Audience Through the Power of Consistency). 09:26 Use your client work to generate interest for products. 10:55 The first experience someone has with your brand is critical. The first interaction sets up the expectation. Don’t even worry about making money—focus on creating loyalty and lifelong customers. 12:03 Without question, replace it immediately. Without question, send another. Cover all costs—even if it’s the customer’s fault. Then give them a discount on their next order ON TOP of it. 13:10 You can’t think of it in terms of whether the cost incurred resolving a problem with one customer will be realized in tangible returns from that same customer. You have to think about the lifetime value and the importance of your brand perception. They very well could recommend you to someone else based on that positive experience with you where you so promptly resolved their issue. You can’t put a price on that. 17:23 The Trifecta is how you make a living. The first place you’ll arrive at is making a living collectively through several various means. But as you grow, because you overlapped and diversified, you’ll eventually be able to support yourself with any single one of your pursuits. 20:10 Client work is great for generating quick revenue. Products require a lot more preparation, investment, marketing, and launching. 21:29 Creating products from client projects, and the legal preparation needed to have the freedom to do so. 24:12 Ideally, the work that you’re doing for clients relates very closely to the type of products you want to sell. This way, as you share the results of your client work, you are simultaneously building an audience for the work that you like to do and the products you want to make. 24:45 You have to capture interest (Related: e042 Why You Need an Email List & How to Master Your Marketing). it’s not good enough just to have comments of people saying they’d buy your products. 25:10 Talking about lead magnets. 27:12 If the product is one that solves a problem (as opposed to a nice-to-have), you can give away 10% of the most valuable, problem-solving aspects of that product for free in the emails leading up to your launch. 27:29 It gives them a taste of what’s to come and let’s them know what to expect. If it’s a nice-to-have product, you can share behind-the-scenes and show the creation process or tell a story. 28:05 Don’t just say, “5 more days until the product comes out!” Find a way to provide value every time you send any communication. 28:32 Let them into your world a little bit, so they can see from your perspective. Tell a story to help people care about your product like you do. 28:57 Provide details like price and specific time of day the product will be available. 30:19 When you give away the best parts for free, people will assume the paid content is even better. Not only that, but their perception will be shaped by the value they received from the free material they got. 30:39 It’s easy to get overwhelmed, but don’t allow that to incapacitate you. You can start out by simply putting up a page with an image and a Paypal button. Don’t get caught up in doing everything perfect. There’s way more than you can ever consider with the launch of your first product—so don’t try to do everything perfect at first. 31:15 Don’t try to do everything 100% right, because you’re not going to be able to. It’s an iterative process and you’ll very gradually get a handle on everything. Allow for iteration to make your next thing better. 33:46 Reinvest your profits back into your product business. Restock products, build out your platform, invest in infrastructure. 34:50 Stop trying to get quick returns—think of this as a long term business. You don’t want a scarcity mindset with products. You don’t want to squeeze the money out to pay bills. This needs to be totally separate. It needs to be completely overlapped and treated as its own individual thing. If you have 100 people on your list, expect 2 of them to buy. 36:21 I know 2% conversion sounds really low, but that’s just reality. Don’t buy too much inventory in the beginning. Err on the side of buying a little bit less than what you think you might need, because you actually want to sell out because it creates demand. Because of social proof, when people see that something is “sold out” they realize that it’s in demand. Because other people want it, they feel more inclined to want it themselves. Have a restock notification list to capture that interest. 39:32 Don’t confuse “investing when it hurts” with “investing too soon.” There needs to be interest before you put something out and you have to assume that a very small number of the people that say they’re going to buy something will actually buy it. The only way to know that someone will buy something is after they’ve swiped their credit card. Before that, words mean nothing. 40:19 It’s going to depend on a number of factors, including what your products are, the cost of your products, how often you put them out, how often the average person buys, etc. For me, I consider a person who buys 3 products in a year or less to be loyal. Either that or someone who buys a big ticket item. 43:45 Actually, it would be smart in a lot of cases. If you’re in an industry where people pretty much do everything online, you can set yourself apart by doing something physical. 45:52 The story of how I essentially hand out $5 bills to everyone I meet. If your product is a problem-solving product, giving away 10% of the best problem-solving aspects for free is a fantastic way to market it. If your product is a nice-to-have, share behind-the-scenes details or insight to the creation process. Telling a story is your best friend.